Gymnast doing warm-up. Workout in the gym. Female slim legs standing in pose in spotlight on black background in studio. 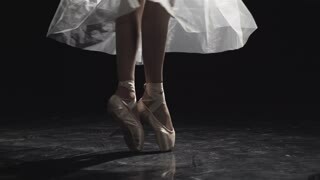 One feet in pointe and another feet without shoe. Close up. Rotation view of a cute little girl training the gymnastics in a white modern ballet school. Modern kids, talented child. Modern dance, leisure time, favorite activity. 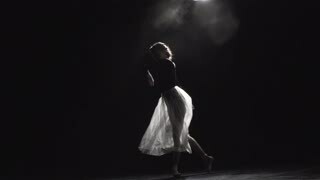 Girl passionately dancing. Slow motion.